To make sure that you get the best of our Far North Queensland tropical paradise we want to offer you EXCLUSIVE discount rates on our Airport Shuttle buses. We can transport you to your hostel in Cairns or Port Douglas for the lowest rate in town, find a full list of participating hostels in the side bar. We want you to enjoy this spectacular part of the world without having to worry about anything, we'll make your trip easy! Once you've booked your ticket online, you'll receive a confirmation email. When you arrive at the airport, head to our desk in either Domestic or International arrivals where our friendly team will present you with your ticket and let you know where to get the bus (we have the closest bus stops to the terminal, so not far to carry the backpack!). Cairns Backpacker Hostels to Cairns Airport - EXCLUSIVE RATES! 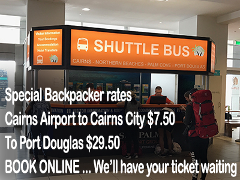 Cairns Airport to Port Douglas airport shuttle - EXCLUSIVE DISCOUNT!